Arching tube-shaped florets of pure white are arrayed gracefully along the upright branching flower spikes, lending a light, airy note to your garden or pots. A low maintenance flower with all-season bloom. 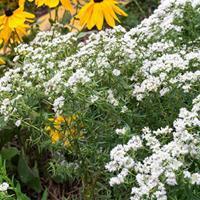 Add sparkle to your summer borders and attract native pollinators with this top performing annual. 'A most elegant species...', said Joseph Breck in 1851. 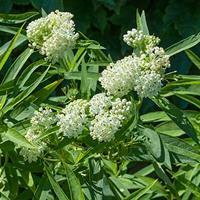 This enduring annual has fleshy green and white ribboned leaves that develop in summer and pair well with colorful zinnias. Avoid cutting without gloves, as the sap can cause dermatitis. A native of Missouri and Arkansas. Self sows.